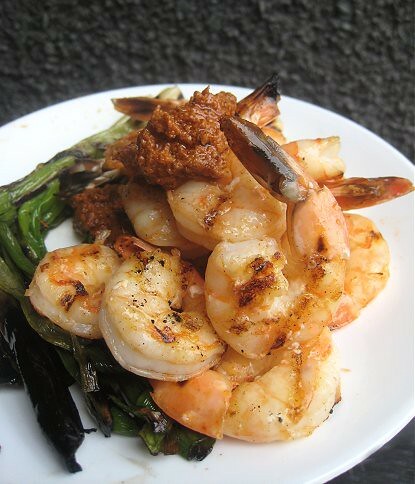 Salsa Romesco atop grilled prawns. How can we do a Spanish menu and not make Romesco sauce? 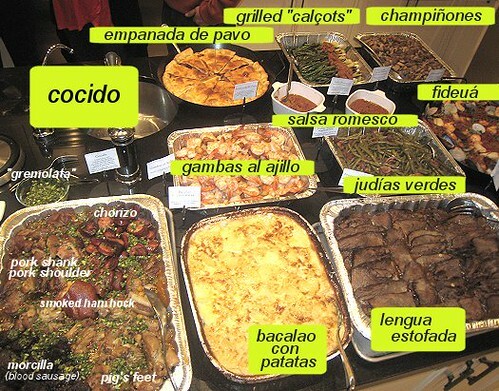 As Núria says, it is the "Queen of the Catalan sauces!" We first heard of Romesco sauce from Culinaria Spain . 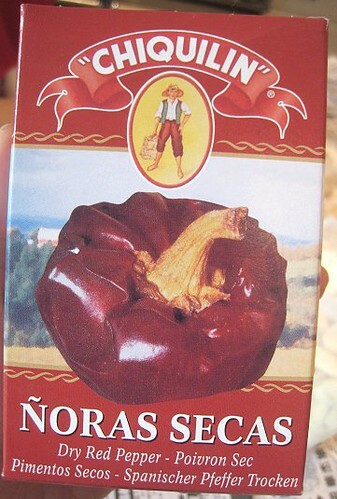 Unfortunately, the book did not contain the recipe itself, just one for salvitxada, which is very similar to Romesco. So, once again, we turned to Núria. Reading the recipe, it certainly wasn't hard. But, in any case, just to get as many tasks done in advance as possible, I decided to make our Romesco sauce for the party a couple of days beforehand. Was I glad I did! Yes, making the sauce wasn't hard, but was it ever time-consuming! Also, I thought the flavors were much better the following days. 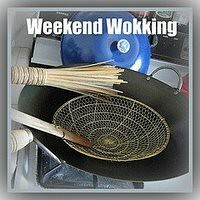 Oooh, I didn't realize this could be entered into this edition of Weekend Wokking! We've been feeling guilty about not submitting anything in a while. The theme is CHILI PEPPER. 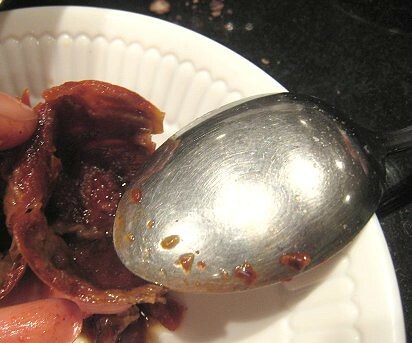 When I read Núria's recipe, I thought I would have to make subsitutions for these ñora peppers, as I was sure I wouldn't be able to find them. But, strolling around the Italian supermarket (incidentally, the same one where we happened upon some bacalao), I saw these small boxes displayed beside smoked paprika and saffron. Score! I soaked the peppers in hot water. I had to remove the seeds and peel and use only the flesh. These peppers were small, and their flesh thin. My first reaction was, "What flesh?!! There's no flesh!" 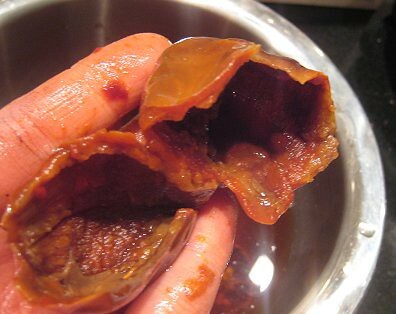 But, I set to work and used a spoon to scrape off the thin flesh clinging to the skins. I also had to roast some garlic and tomatoes for the sauce. That was simple enough, except I left them in the oven a tad too long (more than 1 hour! ), as JS and I were purchasing some morcilla sausage at a Portuguese shop and decided to swing by that same Italian supermarket mentioned above. 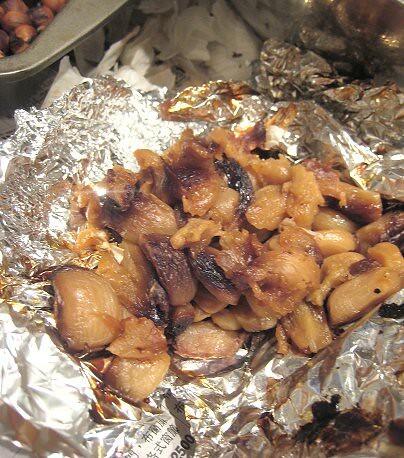 I squeezed the garlic out of their skins, and peeled the roasted tomatoes, discarding their skins. I also needed to roast some almonds and hazelnuts. Then, the hazelnuts also needed to be peeled. Finally, my ingredients were ready to be made into Romesco sauce! Also add to that list some olive oil, fresh garlic cloves, and salt (of course). Although it wasn't an ingredient in Núria's recipe, I also added a touch of white wine vinegar to cut the richness of the nuts. I omitted the mint leaves just because we didn't have any on hand. Everything got thrown into the blender. This sauce goes well with seafood... or anything else! Here it is on some grilled prawns. 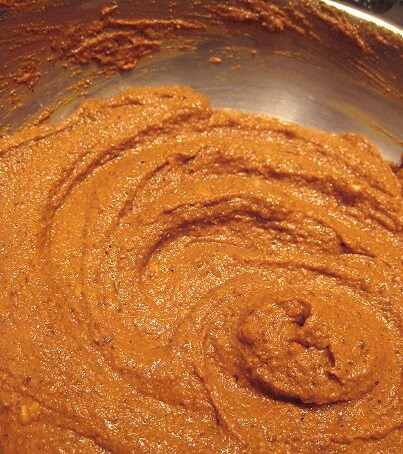 Romesco sauce has such a great, complex flavor. 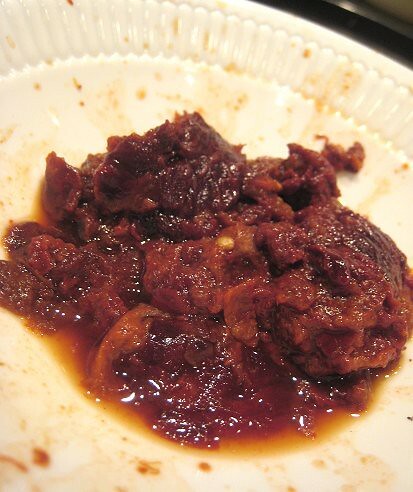 In fact, several guests at the party thought it was akin to Southeast Asian sauces, like a peanut sauce and even a shrimp paste sauce! It just has that big boost of very multi-dimensional flavor. 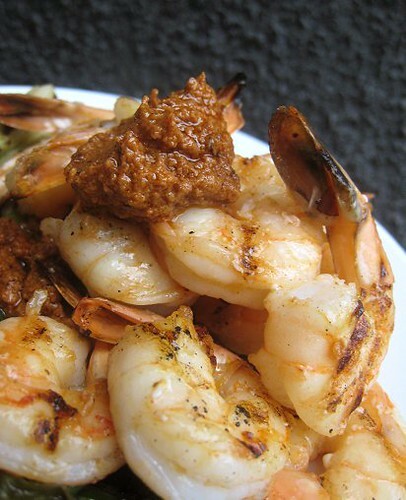 When we ran out of prawns, I just ate it with plain, white rice; I saw a few people at the party doing this. It was still so delicious and satisfying just by itself that I couldn't really complain. Note: I doubled the recipe and ended up with a huge amount of sauce. 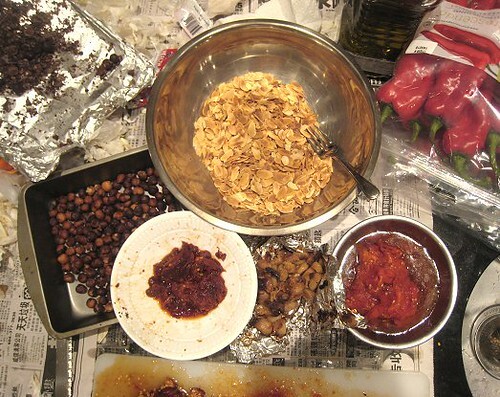 Next up, the reason we made Salsa Romesco in the first place. I'm sooooo impressed with your romesco sauce!!! You found the ñoras!!! That's such good news :D. I think that a bit of wine is an exellent addition! Thanks so much for all your links to my place :D. I appreciate it a lot... know what? you inspired me for another dish... I will link you back, ok? You've convinced me...I think it's time I really try making Romesco sauce. This looks so delicious. I want to drink the sauce! This sauce certainly sounds tasty! I'm intrigued by the fact that guests thought it might be shrimp paste. That's quite a difference. This reminds me of Mexican mole sauces. A lot of similar ingredients and deep, earthy taste. 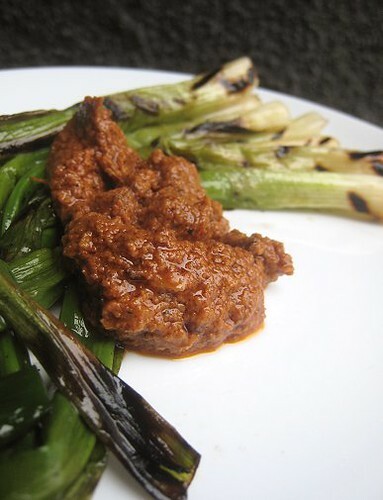 I love Romesco sauce and you have inspired me to make it. Mr. KC used to bring back bottles of the stuff when he travelled to Spain. He wasn't too pleased when a bottle broke and sauce oozed in his suitcase. Now I can have it at home. Yeah. 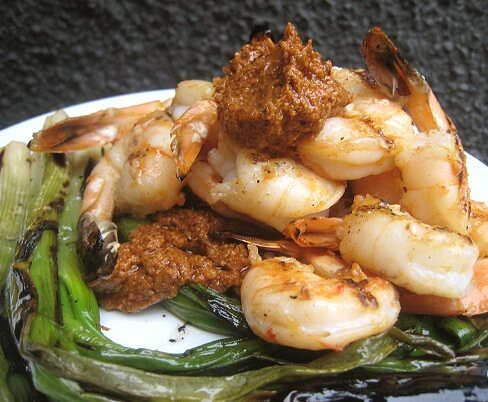 Although, I could see how they would've mistaken Romesco for shrimp paste. It had a similar texture and I guess just a "hard-to-figure-out" flavor. Oh no! Romesco all over one's clothes and things in luggage is not where it belongs at all! Yeah, make it! I wonder how different it will be from the jarred versions.